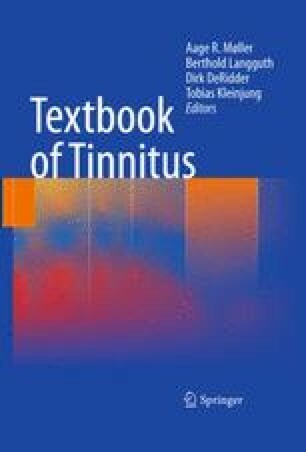 This chapter reviews the current state of knowledge of tinnitus from the neuroscientist’s perspective. Tinnitus is viewed as a disorder involving changes in the rate and timing of spontaneous discharges at multiple levels of the auditory system. Its mechanisms vary, depending on etiology, but most commonly the disorder stems from increases in the excitability of neurons in the central auditory system. Most of the available data suggest that this increase is synaptic in origin, caused by shifts in the balance of excitatory and inhibitory inputs to neurons. However, other mechanisms, such as shifts in the expression of ion channels that determine the resting membrane potential of neurons, may also play a contributing role. Since these changes occur at multiple levels of the auditory system, it is likely that new therapies that will prove most effective will be those that take a system-wide approach rather than those that target specific generator sites. The experiments conducted by the author, which contributed in part to this review, were supported by NIH grant R01 DC009097.